Subtracting decimals is just same like subtracting as usual. How to subtract decimal number? 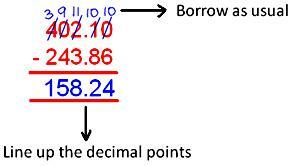 ● Write down the two decimal numbers, one number under the other number and line up the decimal points. ● Convert the given decimals to like decimals. ● Write the smaller decimal number under the larger decimal number in the column. ● Arrange the decimal numbers in the column in such a way that the digits of the same place are in the same column. ● Subtract the numbers in the column from the right. 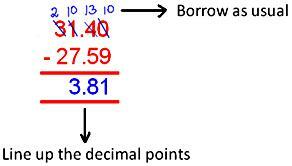 ● Remember to place the decimal point down in the answer in the same place as the numbers above it. Read the above explanation step-by-step and try to understand the examples on subtraction of decimals. 2. Aaron father gave him $100. He bought a math book for $61.35. How much money is left with him? 3. One number is 107.06 and the other number is 79.17. Find the difference between both the numbers.